Baked potatoes are the best! The making baked potatoes in the crock pot idea is rocking my world almost as much as the freezing muffin batter idea. I love it when delicious, simple, and healthy all come together in the same sentence (and on our plates). Now that we’ve started school, I really need easy lunches that don’t take long to prepare. (Which is funny to say, because it’s not like on non-school days I look for meals that are difficult and time consuming. Easy, real food cooking is the way I roll.) The food I’ve made and put into my freezer has helped a ton. I also decided to try throwing potatoes into the crock pot on “hi” instead of “low” one day so they’d be done by lunchtime. It worked perfectly. Then, I rewarmed some leftover roast and gravy, thinking that would taste great on the potatoes. (It did.) We have garden fresh green beans, plus we’ve been picking loads of tomatoes and peppers. This lunch went together so easily, was very filling, and super nourishing! It was also so pretty that I had to take a picture. 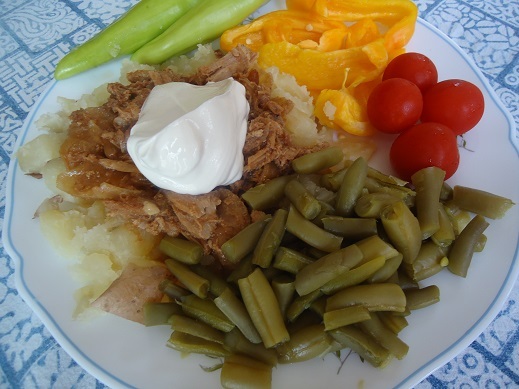 The point of this story: Crock pot baked potatoes are going to be a regular lunch around here. And the other point of this story (or rather, a reminder and encouragement): It is very easy to add fruits and vegetables to a meal to add lots of extra nutrients. We are blessed to have access to such variety. Don’t hold back on fruits and veggies! What are some of your favorite, quick, healthy lunches? Want all the work of menu planning to be done for you? 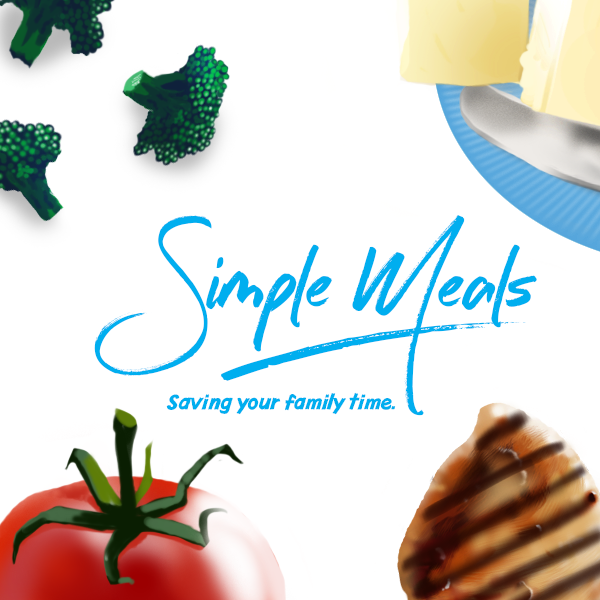 We invite you to subscribe to Simple Meals! We equip you – every single week – to put great money and time saving meals on the table – every single night! Usually, I just steam them for a few minutes. The beans shown in the picture are some my friend picked, blanched and froze for me – so all I had to do was warm them up and serve! If you like eggs, they are an easy stand-by. They can be scrambled with toast, or one of our favorite ways (esp. for a supper), is scrambled with salsa in a wrap. A good source of protein, fast and inexpensive. I’d LOVE to see a post on potatoes. Where do you buy them frugally in bulk (Azure’s are SO expensive!) and how do you store them? Even when I buy just 10 or 20 lbs at a time from the grocery store, they seem to go bad so quickly. I’m in southern CA so no basements, no cellars, no cool places. I’ve heard some people store them in the fridge; others say this is bad for them. HELP! This is one veggie I have not yet figured out how do purchase/store in bulk. Perhaps other readers have suggestions??? 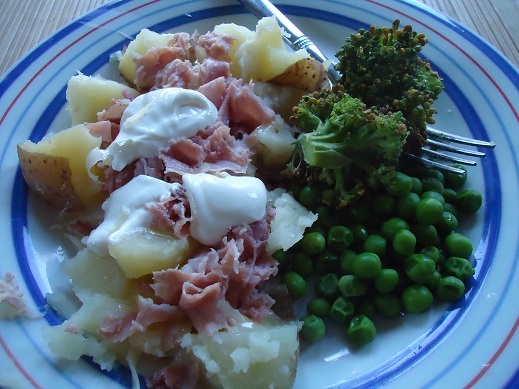 I love crockpot baked potatoes. This is a favorite Sunday lunch for my family. I can throw potatoes in the crockpot, no matter how rushed our morning! Yes. This is a favorite method around here too, especially for schooldays. Kids can grab a potato and finish it off however they like, and it holds them over a while!! My go-to crowd feeder is crockpot baked tators. For just our family I make chili one day and the next day is crockpot tators with leftover chili! This looks so fresh and amazingly delicious! I’m new to gardening, and I haven’t had a lot of results yet! I long for garden fresh veggies!